Now with Relaxor/Pulsor Vibro-Tactile Massage! 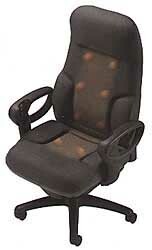 Concorde is an industry "first", providing push-button control of your seating position from the arm of the chair. Push-button control -- the standard in luxury automotive and aircraft seating -- is now the new world standard in workplace seating with Concorde. Innovative and unique, Concorde provides state-of-the-art ergonomic seating for management, multi-shift and tall/large applications. What makes it unique is Concorde's arm-mounted push-button controls. Press once, and Concorde floats free. Press again, and Concorde locks firmly in position. Control buttons turns the massage function on or off. LED lights in the right chair arm illustrate which massage motors are in use. A control wand allows specific adjustment of the massage type, location and intensity. Rechargeable battery slides into the built-in, under seat pocket (AC adapter also included). Rechargeable battery and charger are included with each chair at no extra charge. 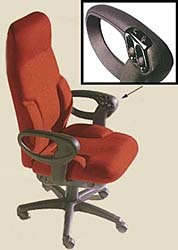 Ergonomists have determined that the human body cannot remain static for long periods of time. To remain fresh, alert and efficient, the body must make small but constant movements to eliminate muscle fatigue. Concorde advances this most fundamental support requirement...push-button controls allow you to instantly adjust back recline, chair tilt and seat height positions...sustaining body and mind in new levels of comfort as you work.